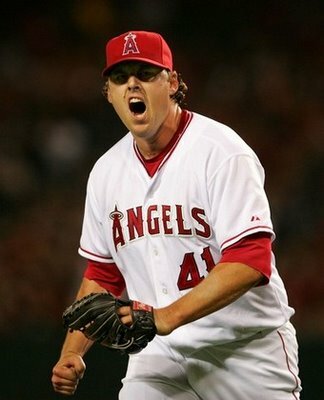 ARLINGTON, Texas – Former UT Arlington Maverick, John Lackey, starts tonight for the Los Angeles Angels of Anaheim in Game 5 of the American League Championship Series against the New York Yankees. Lackey will try and keep the Halos alive in the best-of-seven series as the Yankees own a 3-1 advantage. Lackey, who played at UT Arlington during the 1998 season, was 11-8 with a 3.83 ERA in 27 starts this season. He logged 176.1 innings while allowing 177 hits and 47 walks with 139 strikeouts. In his eight-year career, Lackey is 102-71 with a 3.81 ERA, 233 starts and 1,501.0 innings pitched. Lackey has 1,201 career strikeouts with 441 walks allowed. In two starts this post-season, Lackey is 1-1 with an impressive 1.38 ERA in 13.0 innings pitched. His last start – Game 1 against the Yankees – Lackey allowed nine hits and four runs (two earned) with three strikeouts and three walks in 5.2 innings while taking the loss. Lackey is trying to lead the Angels back to the World Series, where the 6-foot-6 right-hander won Game 7 to give the Angels a world championship in 2002. Lackey worked five innings, allowing one walk with four strikeouts when leaving the game with a 4-1 lead against the San Francisco Giants. He became the first rookie pitcher since 1909 (Babe Adams – Pittsburgh Pirates) to win a World Series Game 7.